Please send me more information on The Love Shack Cruises! “The Love Shack” is a 72 foot Bluewater multifunctional yacht. Love Shack Cruises is proud to take you to the Pacific Ocean and Sea of Cortez taking private charter cruises to a whole new level. With a comprehensive list of activities, an upscale venue, and a professional, experienced staff, we will make your next cruise the highlight of your visit, on the most affordable, family oriented, luxury yacht in Cabo San Lucas. Drift the open seas in search of the perfect catch or join us, in the presence of a legendary Mexican sunset, for a party of a lifetime with your closest friends. Celebrate the love of your life, or just celebrate life. Love Shack Cruises provides a list of cruises to accommodate any occasion. Every year during the winter months blue whales, gray whales and humpback whales make the trip from the arctic Bering Sea to waters of the Baja peninsula to mate. Their constant presence can be seen from the shores of Los Cabos. Love Shack Cruises will take you for a daytime boat trip on the private luxury yacht, and will get you as close as possible to these amazing creatures. They will take you to favorite breeding grounds of the whales along the Baja peninsula. 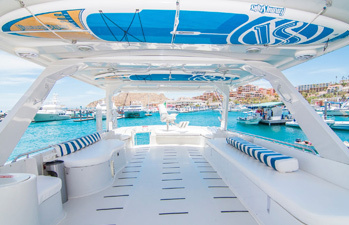 The Love Shack Cabo Whale Watching charter trip include drinks for you and your guests. Cabo Whale Watching cruises are highly recommended during the months of December through April. It is one of the most memorable activities you can embark upon during your stay in Los Cabos. Rates include Mexican Buffet or Ceviche Bar and a National Open Bar. Morning tours include toast and seasonal fruit. Rates include the tax. Venture into the open ocean for a memorable deep sea sport fishing experience on one of the most luxurious fishing yachts in Cabo San Lucas. The 72 ft Love Shack is stocked with full fishing and cruising electronics, 2-speed Shimano tiagra reels on custom offshore rods, a live bait tank and tuna tubes. With top of the line sport fishing equipment and safety gear, you will be ready for the vest local fishing spots that Los Cabos has to offer. 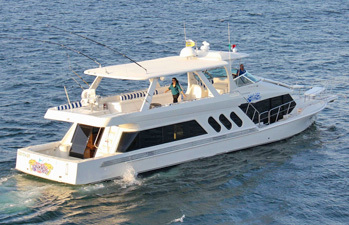 The Cabo Fishing Charters can accommodate as many anglers and any additional passengers who want to come along for the ride to experience Cabo San Lucas fishing. Drinks and lunches are all included in the charter price. The experienced crew will aid you and the members of your team with whatever you need, and all deep sea sport fishing levels are welcome, from novice to expert anglers. Seeing world-renowned monuments – like the famous Cabo San Lucas arch – against the backdrop of a gorgeous Pacific sunset is both breathtaking and memorable. Whether planning a romantic dinner for two or taking the family on an excursion that they will never forget, schedule a sunset cruise with Love Shack Cruises on the private luxury yacht. The ride along the Baja peninsula will give you a unique perspective that few people experience in Los Cabos, with plenty of amazing photo opportunities. Drinks and appetizers will be provided, up to 45 people welcome to your private Cabo Sunset Cruise. Rates include Mexican Buffet or Ceviche Bar and a National Open Bar. Rates include the tax. Participate in a Cabo snorkeling tour on the private luxury yacht and explore the shallow waters of the Baja peninsula. With flippers and snorkel, you can get an up close and personal glimpse of the intricacies of our marine habitat. The yacht is stocked with top quality snorkel gear, and the crew knows all the best local Cabo Snorkeling spots. The Baja peninsula is home to endless species of marine life, including sea turtles, schools of hundreds of species of fish, starfish, dolphins, eels, rays and coral. Rates include Snorkel Gear, Towels, 2 Paddle Boards, Mexican Buffet or Ceviche Bar and a National Open Bar. Morning tours include toast and seasonal fruit. Rates include the tax. Fishing licenses are not included and can be purchased direct. Love Shack Cruises offers the perfect venue for a quaint, formal gathering of close friends and family members. The private luxury yacht is located conveniently at the main Cabo San Lucas marina. Let them help you celebrate your next special occasion in Cabo San Lucas against the backdrop of a brilliant Los Cabos sunset. Whether it be a Cabo destination wedding, an engagement, a rehearsal dinner, reception, anniversary, birthday or a fund raiser, the Love Shack is a stylish venue for any private event. Love Shack staff will work closely with event planners, caterers and florists of your choice to make sure that your special day exceeds your wildest expectations. We are willing to accommodate any special requests you may have, and we can work with you on the timing and length of your cruise (two hour minimum). Cruising along the calm of Sea of Cortez in our state-of-the-art, private luxury yacht will make your event perfect. The Love Shack has room for up to 45 guests, and you can make your event as formal or informal as you wish. All Cruises: Rates do not include gratuity.